There's no understating how important Sea of Thieves is to Rare. 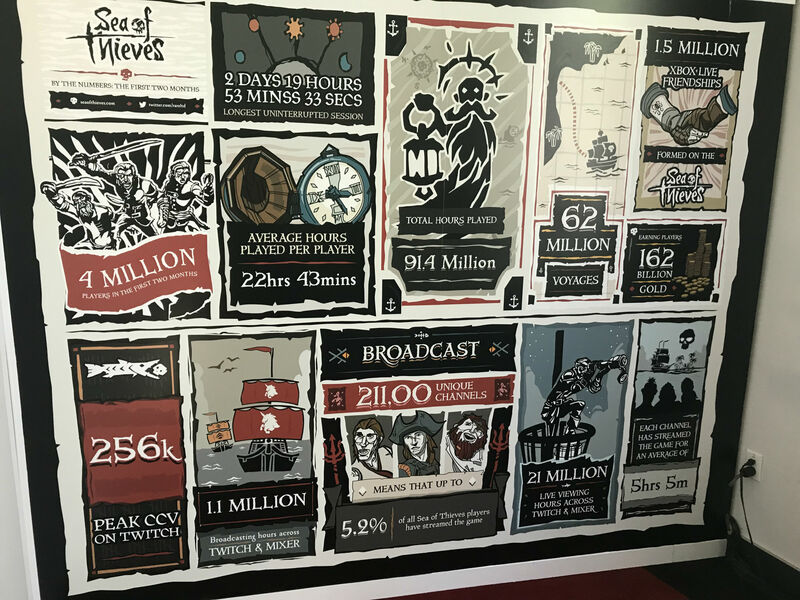 It's the studio's first big gamble since Kinect Sports and the team's Twycross premises have literally been transformed around it, from the decking and pirate cannons to the construction of a tavern set perfect for livestreams. It's also notable for being the developer's first games-as-a-service title, a game designed to be enjoyed for years, not months. It requires a different mindset, one of planning far beyond launch rather than concentrating on the product in the present. And, of course, it requires a substantial and engaged audience to justify the ongoing development. Fortunately, Rare has this in abundance. Last week it was revealed the game has attracted five million players since launching back in March, and continues to do so thanks to more than 40 million hours of the game being broadcast on Twitch, with additional streams and videos found on YouTube and Mixer. "By every measure, it's been an incredible success," says design director Mike Chapman when we meet at E3. To emphasise the point, he's sitting in front of a wall of achievements from the game's first two months. Each user has, on average, played for 22 hours 43 minutes, with the community total well over 91.4 million hours. 1.5 million Xbox Live friendships were made during Sea of Thieves sessions, with pirates sailing together on 62 million voyages and earning 162 billion in in-game gold. It's not all been smooth sailing, of course. 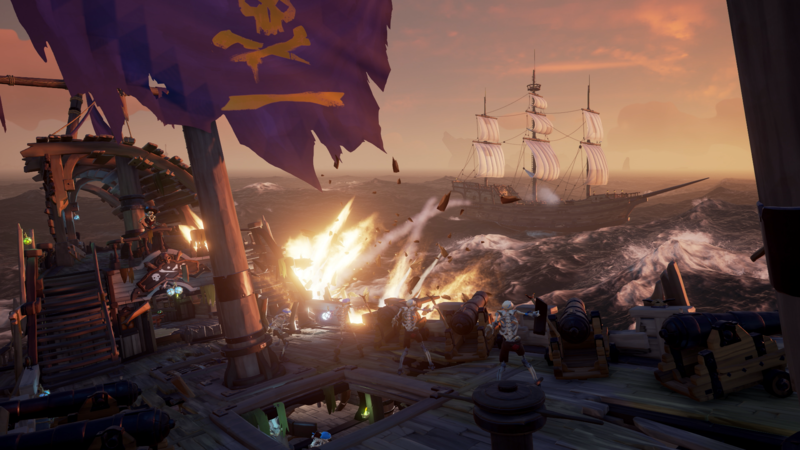 The game's launch was mired slightly by server outages and matchmaking issues, but Chapman says this is simply reflective of how much demand there was for a shared-world pirate game. "I think we had a view of how many people we thought were going to turn up, we had our wildest dreams, we had a contingency on our wildest dreams, and then we had the reality of people that actually turned up," he explains. "So it was bumpy just because of the sheer amount of people coming into the game. There was a huge spike at the start, but after two weeks we managed to stabilise all that and then rolled into quality of life fixes." "We always wanted there to be more than just ship combat between players. We wanted people to watch the sunset, drink grog and adventure together"
Since launch, Sea of Thieves has received two content expansions in a bid to keep the game fresh and retain players for longer. 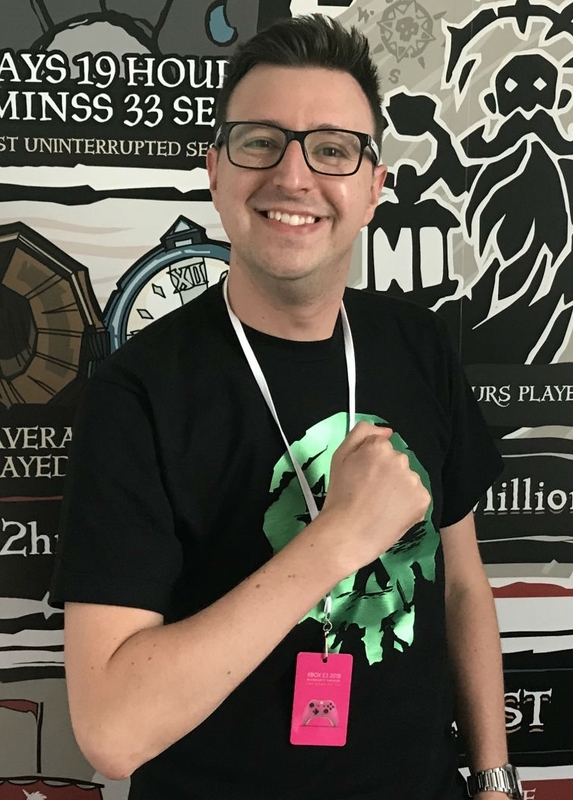 The first, The Hungering Deep, arrived at the end of May - an achievement Chapman is most proud of given the team behind it only had two months of development time, some of which was taken up by fixing launch bugs. The update centred around battles with a Megaladon shark, but also introduced a number of features that drove Rare's agenda to create a more social online game. Speaking trumpets that amplified the proximity voice system and a flag system for display intent to ships at a distance armed players with more communication tools - and Rare's gambit worked. "The fascinating thing was the game became so friendly within those two weeks," says Chapman. "Anecdotally, it seemed like the whole atmosphere on the servers changed. We looked at the data, and that backed it up: we actually saw a 50 per cent drop in ship encounters that ended in combat. It was absolutely fascinating. It was Sea of Friends, effectively, for about two weeks where everyone wanted to work together. "We always wanted there to be more than just ship combat between players. We always wanted a varied number of encounters where people watch the sunset together, drink grog together and adventure together, and Hungering Deep really brought that home. So we've actually gone even further with the social aspects that we're building into the future content releases." More recently, Rare released Cursed Sails, the first of two new expansions announced at E3. 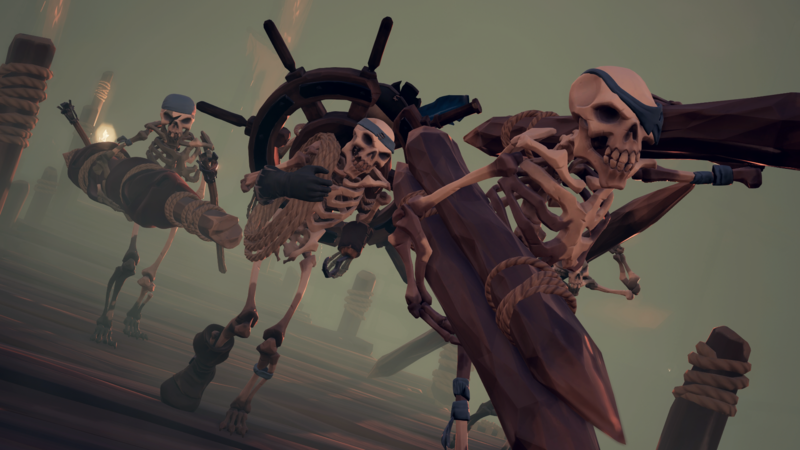 This significantly bulks up the challenges that players face, with (literal) skeleton crews sailing the seas for more PvE combat, and new weapons like the cursed cannonball, which inflict bizarre status effects on their victims - for example, the jig ball forces all crew members to dance on the spot, while the grog ball makes them instantly drunk. It's an interesting release in that, unlike Hungering Deep's social features that built on Rare's original ambitions, Cursed Sails' skeleton ships actually flies in the face of it. "We actually have more people working on the game now than we did before launch. We want to keep expanding this world"
"We spent years saying we'd never do this, that we'd never do AI ships," says Chapman. "We spoke about the dream of having every sail on the horizon as another real player's ship, because we're really principled and we really believe in our creative vision. "But we always said we're going to build this game with our community, and they wanted to see AI ships in the world. When you think about skeleton ships battling other ships, with me and you crewing up on multiple galleons and taking down this shared threat, it sounds amazing for the Sea of Thieves world. That felt like a piece of content that would really please our community, but it's not just about doing the things people are asking for. We want to surprise and delight people. We want to do unexpected things." Case in point, the next expansion: Forsaken Shores. 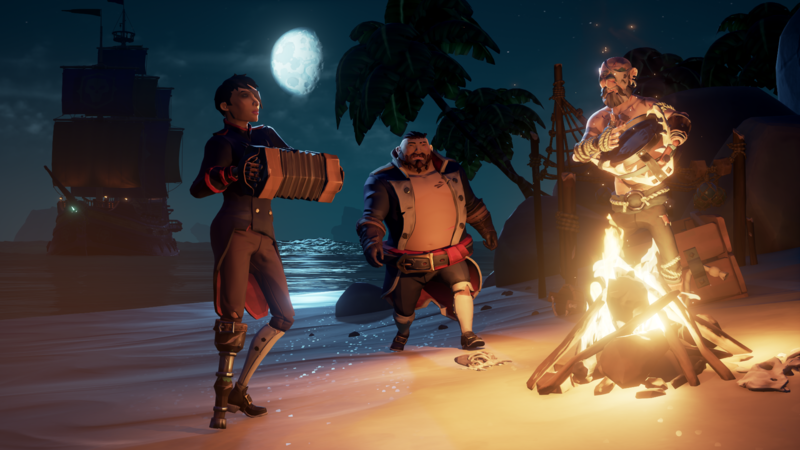 Due in September, this answered the call for more islands and areas to explore, but rather than simply building on the template forged by Sea of Thieves' current land masses, Rare is determined to do something different. The new region, Devil's Roar, is a "volcanic, geologically unstable region" where resources are more scarce and danger comes from unpredictable earthquakes and eruptions. It's designed as a more difficult landscape that players essentially opt into when they travel there, since the current Sea of Thieves map is on the same difficulty level to account for the fact new players can spawn anywhere. "Rather than just giving you more of the same, we wanted to introduce the idea that the islands themselves could be a threat," says Chapman. "We could be on an island together looking for treasure, and suddenly feel this tremor that makes us stagger about. We stagger towards a crater, where black smoke starts to rise out, and at any moment that could erupt, spewing hot rocks that rain down." Those rocks can also hit and damage the ship, so Rare has introduced another new feature: the rowboat. This enables players to anchor at a safe distance and row into each island. Cursed Sails also introduces a new vessel, the three-player Brigantine for less than full crews, and Chapman points to both additions as being "reflective of our approach" to ensuring expansions don't just pad out the game but improve it as well. "We're bringing in bundles of content that thematically work well together, but then that rowboat is going to enhance the experience across the whole game," he says. "Now solo players row into an island, fill it up with chests, skulls and other quest items, and row back in one go rather than doing multiple trips back and forth." Forsaken Shores makes for three expansions within six months of launch, and this puts Rare very much on course to achieve its goal of new content every six to eight weeks. That's a surprisingly high cadence for an online game, but one Chapman believes will ensure players never tire of Sea of Thieves. Crucially, Rare is keen to avoid simply knocking out lacklustre expansions every two months. Each release is being handled by a separate team, with four teams working in parallel. The Hungering Deep crew, hampered by their two-month window, has been working since that launch on the update that will follow Forsaken Shores. The Cursed Sails team is now working on the expansion after that, and the recently formed fourth team will release its first content update by the end of the year. "[With monetisation] we won't step on the shoes of the gameplay, we won't segregate our players, we certainly never would do pay-to-win"
Behind the scenes, it means each team is getting longer to work on their next expansion, but from the player's perspective a meaty new update is released every six to eight weeks. In addition to this, there are the regular Bilge Rat Adventures: limited time in-game events that add new challenges for players, such as the hard-to-find skeleton thrones. These two-week events help avoid stagnation between expansions, and the combination of both will be expanded upon in Sea of Thieves' second year. "We actually have more people working on the game now than we did before launch," says Chapman. "We're doubling down on this massive success. We want to keep expanding this world - it's pirate fantasy so there's a million and one ideas we can explore." All in all, this means Rare's online pirate game will have six hefty expansions, plus a few features added through the regular events, by the end of the year - an impressive feat compared to the likes of Destiny, where new expansions are only release once or twice a year. Even more impressive is that Sea of Thieves' updates have all been free so far, and will be for the foreseeable future. While Rare acknowledges some form of monetisation may need to be introduced at some point, if only to help fund this intensive ongoing development schedule, it's determined to avoid the mistakes made by past online titles. "We will never charge for those content releases, because that would segregate our players," says Chapman. "We took decisions around never having power progression in the game - you might have it within a session, if someone finds a gunpowder keg or other weapons in the world - because otherwise you'd reach the stage where certain people couldn't play together. You'd have this weird thing of having to keep up with your friends, maybe feeling like you were being left behind. That will never happen in Sea of Thieves. So the idea of having to buy an expansion in order to play with your friends - we'd never do that. "We have no plans locked in place now on when we'd add monetisation. The one thing I will say is if we do that, we won't just take something from another game and put it into Sea of Thieves. The way we've looked at mechanics, tried to innovate and do things differently, we'd want to do that with monetisation as well. It's not just about taking another approach and forcing it into Sea of Thieves. With all of our mechanics, it has to feel at home. "We won't step on the shoes of the gameplay, we won't segregate our players, we certainly never would do pay-to-win. It would be around something that players love, and a way for them to keep enjoying the content." While Sea of Thieves has attracted five millions players, there's still no indication as to how many of those remain active. Chapman admits there was some drop-off after launch - as is to be expected with any new release - but assures the community is healthy enough to warrant the ongoing development. And the ability to broadcast the game - a phenomenon that was far less prominent when development began - has proven to be most proficient in keeping Sea of Thieves front and centre in Xbox owners' minds. "Because there's this incredible amount of mechanical freedom, it's inherently watchable," says Chapman. "A lot of big streamers came into the game [at launch], bringing their audience with them. A lot of those streamers typically play PvP games, so you had a lot of behaviour on the servers that was more combat-focused, very one-dimensional, almost playing it like Counter-Strike. Those guys play a lot of games so they moved on, and Sea of Thieves stabilised to a really healthy core where people are doing a variety of things. "Traditionally, you see a huge spike at the start and then a managed decline until there's nothing. The idea was to keep this community engaged, so there's always something to go and earn, and these regular content releases. As long as players are loving the game - which they are - and as long as they keep coming back, we'll keep making content."